Maintaining your Connecticut home and its exterior increases the life of your premises. It not only improves the appearance of your home, it can save you money in the long run. It also increases the return on your home or commercial premises at the time of selling. We clean home and business exteriors… Vinyl & aluminum siding, wood siding, clapboards and shingles, stone, brick or concrete exteriors, and drivit. We clean walking areas… Stone, brick, concrete, or pavers. We clean decks and gazebos… pressure treated, ipé, mahogany, cambara, cedar, or any exotic wood…we can clean and preserve it. We clean patios and pool areas… Stone, brick, concrete, or pavers. We clean patio furniture… teak, cedar, powder coated metal furniture and more. We can prep your home before painting. We have hands-on experience and specialize in all aspects of pressure cleaning and exterior property detailing. If you have a well we can supplement your water. We created a page to help educate you about pressure cleaning. Click here. 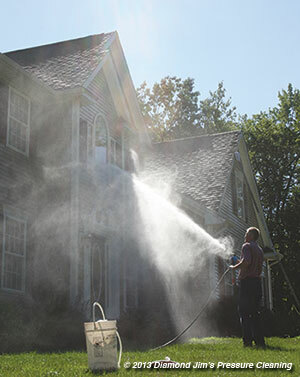 If you are in need of pressure cleaning services in Connecticut, call us today at 203-558-0968 or complete our online form.